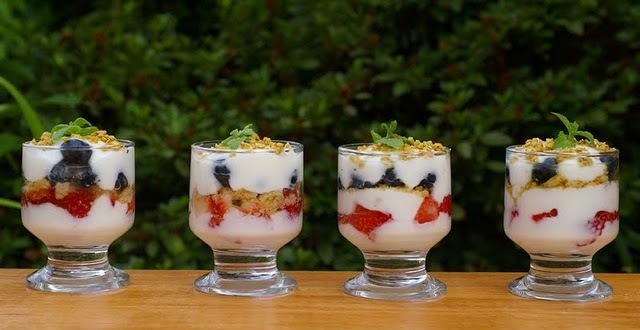 I love to make these parfaits for breakfast. I feel like I am being decadent even when I am not. You can make these for your little ones and make them think they are getting a treat. This treat is also good to make for dessert. With it being so hot, it is a great no bake recipe that everyone will love. Shhh, dont tell anyone, but it is good for you and under 300 calories. You are welcome and Enjoy. 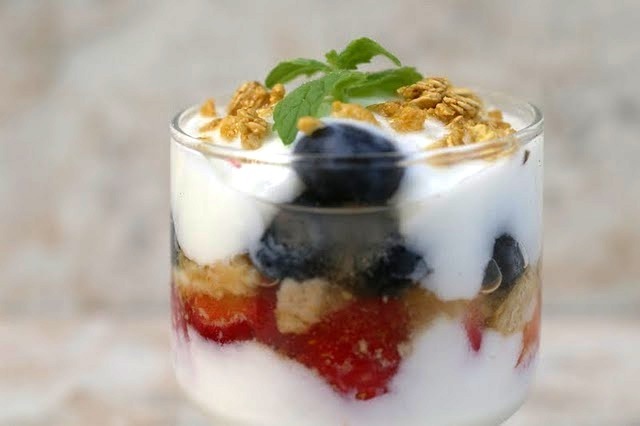 In four parfait or cordial glasses, layer vanilla yogurt, bananas, strawberries, blueberries and cereal. Garnish with mint. These look sooooo good! 😉 Thanks for joining my Catholic Blogs link-up! I’ll be stopping by again! God bless!